The AccountMate Return Merchandise Authorization (RMA) module allows you to record and monitor the progress of your customers’ sales return transactions in AccountMate. With it, you can create RMA orders, receive returned items and ship the repaired, replacement or substitute items. AccountMate automatically updates the item’s on-hand, booked or defective quantity as well as the customer’s balance. It calculates any gains or losses that result from replacing or substituting the customer’s returned items. 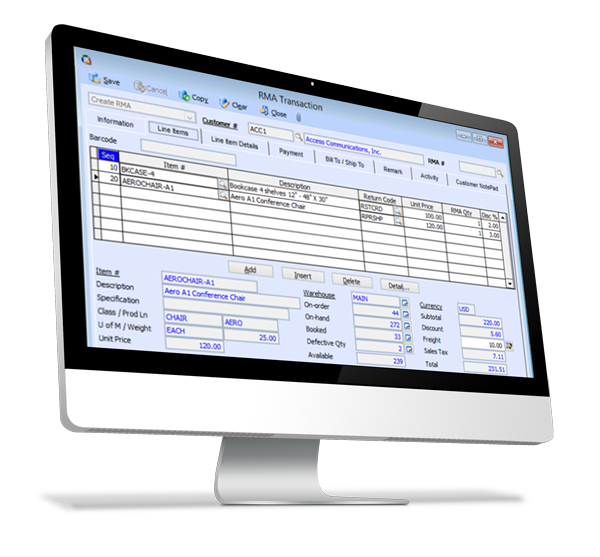 It also generates credit invoices in the Accounts Receivable module as needed. You can create unlimited return codes to represent the different return processes your organization allows. This module maintains a comprehensive list of customer and inventory records that are shared with AccountMate’s Sales Order, Accounts Receivable and Inventory Control modules. It also comes with functions like Inventory Warranty Maintenance and Defective Inventory Adjustment for a thorough and accurate management of your RMA orders.